Authorities have rejected 20 per cent of the total 99,019 foodstuff shipments that arrived at the port of Dubai during the past six months. The food control department of Dubai Municipality (DM) has dumped large quantities of spoilt food items ranging from dairy products, frozen meats, marine products, chocolate, biscuits, candies, coffee products and food additives, according to a senior civic official. Iman Ali Al Bastaki, Head of the Food Trade Unit at the DM, said that 93,879 food shipments were released after procedures of public health safety monitoring, while 7,840 shipments were rejected due to non-compliance with the municipal condition on food safety. “Among the rejected shipments of foods, 386 were meant for re-export purpose. 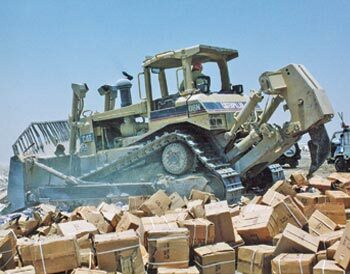 Food items of at least 647 shipments have been destroyed as the items were spoilt and damaged,” she added. “The food shipments were rejected, as the importers didn’t adhere to the regulations on public health safety, and some others violated food labeling laws, while others imported the foods without a food trade license,” pointed out Al Bastaki. “The DM has completed registration of more than 160 food items through an integrated online system for control of food imports. No unregistered food items are allowed to sell in the Emirate. The Municipality has started applying the standard new law on food labeling,” she noted. According to her, the food consignments are not accepted if unlicensed companies practise food trading activities by importing food items from other countries. The DM also rejects shipments that violate the food label regulations approved by the competent authorities or the rules of import. “Foodstuff importing companies should have facilities like storerooms that comply with the civic bodies rules and regulations regarding the safety of public health. The food control body at DM plays a significant role in controlling the entire foodstuffs imported in the emirate all around the year,” she elaborated. “Regulations as per the latest food quality verification standards have been applied by the DM. Clauses regarding the food label and expiry date information have to be included as per the new law approved by the Gulf Standards Authority, as well as the laws outlined by the authorities concerned in the UAE,” she said.